Transportation in France relies on one of the densest networks in the world with 146 km of road and 6.2 km of rail lines per 100 km2. It is built as a web with Paris at its center. France has a system of large, navigable rivers, such as the Loire, Seine and Rhône that cross the country. There is a total of 9,501 kilometres (5,904 mi) of railway in France, mostly operated by SNCF, the French national railway company. Like the road system, the French railways are subsidised by the state, receiving €13.2 billion in 2013. The railway system is a small portion of total travel, accounting for less than 10% of passenger travel. Six cities in France currently have metro (rapid transit) service. Full metro systems are in operation in Paris (16 lines), Lyon (4 lines) and Marseille (2 lines). 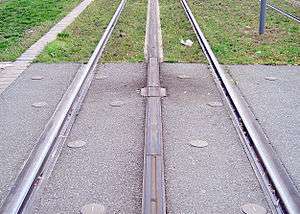 Light metro (VAL-type) systems are in use in Lille (2 lines), Toulouse (2 lines) and Rennes (1 line). 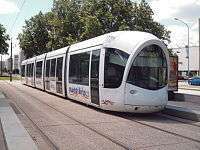 Tram systems are planned or under construction in Dijon, Le Havre, Tours, and Fort-de-France. 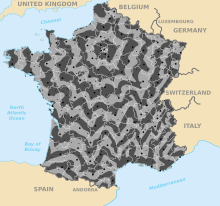 There are ~950,000 km of roads in France. 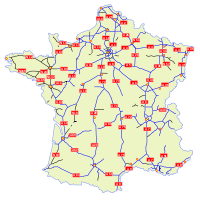 The French motorway network or autoroute system consists largely of toll roads, except around large cities and in parts of the north. 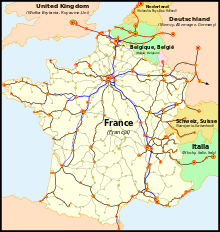 It is a network totalling 12,000 km (7,500 mi) of motorways operated by private companies such as Sanef (Société des autoroutes du Nord et de l'Est de la France). It has the 8th largest highway network in the world, trailing only the United States, China, Russia, Japan, Canada, Spain and Germany. France is believed to be the most car dependent country in Europe. In 2005, 937 billion vehicle kilometres were travelled in France (85% by car). The French natural and man-made waterways network is the largest in Europe extending to over 8,500 kilometres (5,300 mi) of which (VNF, English: Navigable Waterways of France), the French navigation authority, manages the navigable sections. The assets managed by VNF comprise 6,700 kilometres (4,200 mi) of waterways, made up of 3,800 kilometres (2,400 mi) of canals and 2,900 kilometres (1,800 mi) of navigable rivers, 494 dams, 1595 locks, 74 navigable aqueducts, 65 reservoirs, 35 tunnels and a land area of 800 km2 (310 sq mi). 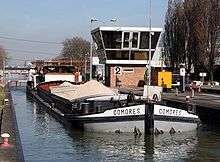 Two significant waterways not under VNF's control are the navigable sections of the River Somme and the Brittany Canals, which are both under local management. ↑ "Modal split of inland passenger transport, 2002 and 2012". Eurostat. 2012. ↑ Associated Press (2007-04-03). "French Train Hits 357 mph (575 km/h) Breaking World Speed Record". Fox News. Retrieved 2007-04-03. ↑ "French rediscover love for streetcars". UPI. Paris. 2008-07-18. Retrieved 2008-08-13. ↑ Allez le Tram from Railway-Technology.com. Retrieved 15 February 2009. ↑ Porto:Metro from NYCsubway.org. Retrieved 15 February 2009. ↑ Georges Dobias: Urban Transport in France from Japan Railway & Transport Review, 16 June 1998. Retrieved 15 February 2009. ↑ Dualis extends the reach of the Citadis family from Railway Gazette, 2 June 2007. Retrieved 15 February 2009. Archived February 13, 2009, at the Wayback Machine. 1 2 "Transport in France". International Transport Statistics Database. iRAP. Archived from the original on 20 December 2008. Retrieved 2009-02-17. ↑ "France by Bus and Coach". Angloinfo. Angloinfo. Retrieved 2016-06-15. ↑ "France's loss-making inter-city services at a crossroads". ↑ "Waterways development". VNF. Retrieved 2008-10-29. ↑ "Presentation complete" (PDF). VNF (in French). Retrieved 2008-10-29. ↑ "Questions and Answers". VNF. Retrieved 2008-10-29. ↑ Voies navigables de France: conjuguer économie et écologie. Retrieved 19 February 2009. ↑ Le transport maritime from Armateurs de France (in French). Retrieved 20 February 2009.